This is something that I’ve always noticed. I guess this post is about stereotypes in a way, but that’s not the intention. And I know not saying what you wanted to isn’t very good writing, but this is more of a ramble from the heart, so you’ll have to make do. 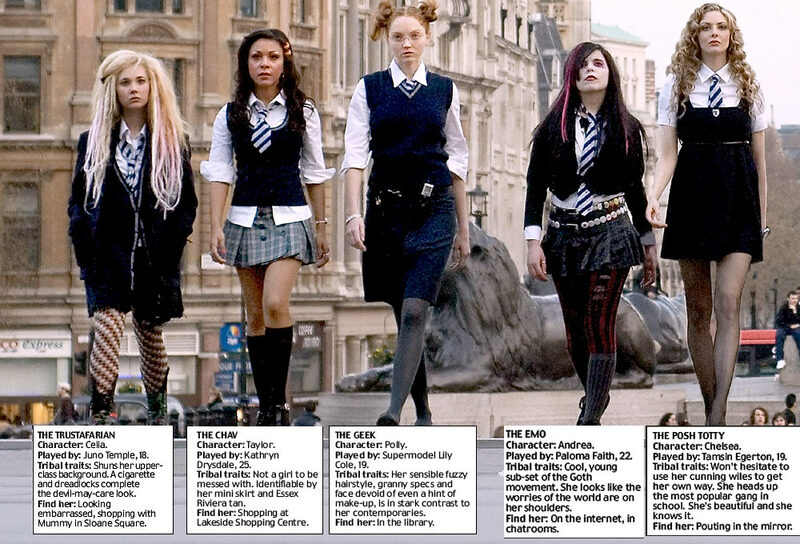 Very stereotypical.. From St. Trinian's possibly? Some people get ridiculously offended by stereotyping people, but I think it’s only natural. In a way it’s good. It gives you an identity of sorts. I know everyone is different and unique, but alot of what you do with your life has to do with what type of person you think you are. There are so many internal and external factors that shape you into who you are: Friends, family, where you live, music, what your parents do, how your parents act, TV, Internet, clothes, social scenes, and so on. When all these combine together, it makes you who you are. And there’s nothing wrong with that. You become a person that fits in with some group somewhere, or maybe you ‘overlap’. I don’t see anything wrong with finding a group that you feel you belong in. Fair enough, labelling people isn’t great, but it has its uses. Even in business, with, say, marketing. People like like-minded people, so groups of similar beings are bound to form. I think then, when you find a group, this group influences you even more, and you end up being a certain stereotype. This struck me today when I was talking to a friend about a certain person. Or two people perhaps. She said she ‘didn’t get’ his humour, and ‘wouldn’t like them at all now’. To me though, this person is very humorous, and I think they’re pretty cool. I like how they talk, I like what they wear, I like what the do, I like who they are. She just didn’t get that though. I always knew we wouldn’t go for the same type of person, but she didn’t seem to realise this until I spelled itout for her. Although there is of course a good chance that this is all completely wrong and I’m just a narrow-minded teenager who wants to hang out with cool people and think I’m better than everyone else. This is probably a very likely scenario. News, some good, some bad. I guess the pretty obvious bad news that emerged today is that of the death of Gerry Ryan. We were coming home from school and my mum had to park at the end of the driveway because there were vans and stuff in the way. My cousin the builder was doing some stuff down there, and he said he’d gotten a text that Gerry Ryan had died. This was seconded my some other workman person whom I’ve never seen before. Then I came inside and saw it on twitter, then irishtimes.com. It’s a shock to say the least. I mean I didn’t listen to his show that often, what with school and everything. But there’s no denying that he was a huge part of Irish radio and media, and undoubtedly he will be missed. He’s an inspiration to me in certain ways, as he did law in college, but went on to work in media. Rest in Peace, Gerry. On a brighter note, today we got word of the nominations for the Irish Times SchoolMag competition. We were supposed to have known by March 26th, but things got delayed, and finally we were told today that we have been nominated for three awards. An overall award, and award for design, and an award for my article on Plugd. I first posted that article here actually, and then changed it around and adapted it for the magazine. So I was particularly pleased with that one, but the design one too as I did do alot of that myself. So I was happy out today. However, I was unusually quiet at tennis, because I had read over my Plugd article again, and it made me miss the place even more.. I’m glad that I’ve gotten to voice my opinion about it though, and that someone’s taken notice and actually thought it was good. It’s true what they say though, you should write about what you know. I got a nice message from a nice person today too. Nothing spectacular, but they were just doing a small favour for me, and talking to them brought back good memories, and made me look forward to some other stuff too. It’s weird how you don’t talk to someone for a while, but their personality is so strong it’s like you were only talking to them yesterday. Or maybe that’s just because the year has flown by. Perhaps a mixture of both. I’m tired now, so I think I might leave the laptop. I wish we had more books in this house. And apologies for the lack of pictures. I’m feeling lazy. I woke up to blue skies and the sun shining. And we’re so cool we had actually planned rugby in the park. Although the rugby wasn’t necessarily my idea. I don’t know why we even bothered with the rugby actually. All we ended up doing with it was writing on it. Caroline’s brother now thinks we met Brian O’Driscoll, Ronan O’Gara, Doug Howlett, the Pope (Joe), and some ‘girlz’ today who all signed his rugby ball. Anyway. We met for a coffee in town first, and my loyalty card was full so I had an amazing large cappuccino in CCR, and it tasted even better due to its free-ness. We walked to town, got to the park, stopped for me to be abused about my blog, my non-existent hipster-ness, and me as a person in general. And of course some snacking on cookies. We went and spent the afternoon on a bench by the river having tiger loaf and cookies and tossing the rugby ball a few metres when we felt like it. We also had a stroll up to the Shaky Bridge and intimidated passers-by. And it was just like summer again, what with the sun and us actually being able to ‘hang’ in an outdoor area. I also made Aisling take pictures of me so I can do a clothes post once I get my hands on the photos so you can be waiting in anticipation for that..
I’m not just being mean. I’m not having a bad day. I’m not trying to find something to rant about. I’m not holding any grudges. There are just some people who I find it hard to like. It’s awful, really awful, if someone annoying comes along and ruins your day. You may not be able to complain to others, and there may not be any specific reason, and that’s the worst about it. If it’s someone who is blatantly annoying or even abusive, then it’s fine, because you have a reason. But if it’s just some person who grates on your nerves for absolutely no reason. It’s like nature just meant it to be. It’s as though you’re both the same end of a magnet, repelling each other. I don’t know how else to put it. Is it just me being irritable? Maybe, when I think about it, there are reasons why certain people annoy me. No-one annoys me for absolutely no reason. But the aspects of a person’s personality that annoy me don’t annoy others. Is it because, as people, we like and dislike different things? Or is it because some people are far more tolerant than others? Some situations tend to increase tensions, especially Christmas with family. There’s always some stress surrounding the whole dinner and celebrations and whatnot. And if you’re stuck with relatives for days on end, any one of them who annoys you is going to annoy you even more, for the simple reason that you just can’t escape. It can also happen within a group of friends, where two friends don’t get along for no apparent reason. It might be quite obvious, or perhaps not noticed at all, even by the person who is the ‘irritant’ so to speak. Just the ‘victim’, the person who is annoyed beyond belief, but who can they go crying to? That’s just life folks, and you gotta deal with it.